You don’t have to be the daughter of a former Big Ten and NFL quarterback to excel at volleyball, but it seems to help. 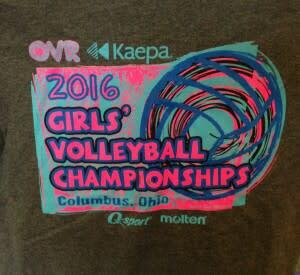 Led by Emma Tupa and Ella Grbac, the Cleveland Volleyball Machine advanced to the finals of the 16-year-old National Division at the 2016 Kaepa Girls’ Volleyball Championships on Sunday at the Greater Columbus Convention Center. Saturday and Sunday were the third of four successive weekends of action in the tournament hosted by the Ohio Valley Region (OVR), a member of USA Volleyball. The four weekends of non-stop action will attract about 13,000 players on 1,320 teams from all over Ohio, as well as Pennsylvania and West Virginia. As you walk into the massive exhibit halls filled with 54 volleyball courts, you’re hit with the sounds of squeaking sneakers, volleyballs being spiked, officials’ whistles and the cheers of the 50 to 100 family and friends sitting in foldable chairs and surrounding each of the courts. “There are so many things going on all at once,” said Beth Tupa, who was in town to watch her daughter’s team play, along with her husband, Tom, the former Ohio State football star and long-time NFL player. Ella Grbac is the daughter of Elvis Grbac, who starred at Michigan and also had a lengthy NFL career. 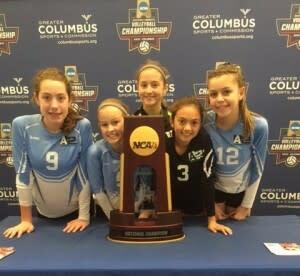 Elevation Volleyball Club (from Cincinnati) topped the Cleveland-based squad in the 16 National finals. 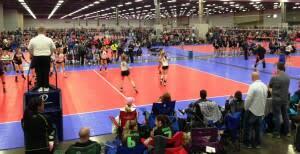 Maverick Volleyball Club won the 15 National finals on Sunday. Beth was – and still is – an accomplished athlete. She grew up in Colorado playing tennis, and still competes in age-group tournaments. “There wasn’t anything like this back when I was in school for girls,” she said of the Kaepa Championships. Girls volleyball has become huge locally and nationally at the youth, junior, college and senior levels, and the OVR is one of the largest regions of USA Volleyball. The Greater Columbus Convention Center has hosted more volleyball games than any other facility in the country, according to OVR officials. “It’s organized chaos,” said Sandra Borer of OVR, which has more than 20,000 players. “We have eight major tournaments here a year, on multiple, multiple weekends.” The OVR’s Bill Zehler and Al Herbert are experts at keeping everything running smoothly and making sure the organization outpaces the chaos. But for the first-time player, parent or fan, one of the OVR’s massive tournaments can be a bit overwhelming. There’s almost too much action going on. Tracy (Endecavageh) Vondran is coach of the Columbus Volleyball Academy 16s. She played on the Ohio State teams that won the Big Ten championships in 1989 and 1991. Vondran has been coaching in Central Ohio for 25 years and has noticed some changes. “Teams from this region win national championships every year,” said Jon Rowling, whose daughter Patty plays for Vondran. The team advanced to the quarterfinals of the Kaepa Tournament on Sunday before their run ended. The Cleveland Volleyball Company 16s are chock full of future college stars. “Most of the girls on the team will play in college and four have already accepted scholarships,” said Beth Tupa, adding her daughter is being recruited by several schools. And speaking of college volleyball … the NCAA Division I Women’s Volleyball Finals will be held here at Nationwide Arena on December 15 and 17, further cementing the city’s growing reputation as a volleyball capital. Vondran and her team plan on attending. “I’m very excited, it’s going to be great,” said Vondran, adding that she expects thousands of the girls competing in the current Kaepa Tournament to attend. In other words: You better get your tickets now.